Marg at Reading Adventures, and Kailana at The Written World are hosting the Blog Advent Tour 2008. Every day, participants post a bit of Christmas until December 25. Today it's my turn. And whew, have I been a little nervous about what to post. Earlier in the month, I posted about the fact that I had no Christmas spirit, and in order to defeat that feeling, I was going to write about Christmas as much as I could. I took pictures of my tree and my kids, my Advent calendar, I elfed the family, I answered Christmasy questions... what haven't I written about already? I may have mentioned before that my family as a child didn't really celebrate Christmas, but clearly what I meant by that is that I don't remember our family celebrating Christmas in a traditional way. We very rarely stayed at home. We stopped putting a tree up after my brother and I turned a certain age. After awhile, our family grew apart and were hardly in the same house together. Because of this, I'd love it if my children grew up remembering specific holiday traditions. Fun ones, things we did together as a family, things that could think back on fondly. The smell of baking, laughter. My husband N plays the piano and every year he plays for us and we sing carols together. And I started one as well. It was difficult to remember, because it isn't a tradition specific to Christmas, but it orginated at Christmas and I carry it on every year. It happened by accident. 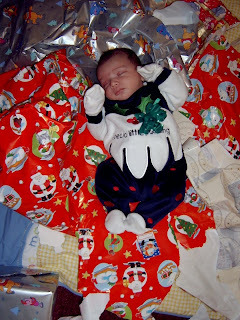 My oldest son, Elliot was less than 4 weeks old on his first Christmas. He slept through us opening his Christmas presents for him, he slept most of the day in fact. When the presents were all opened, I wanted a nice photo of him. 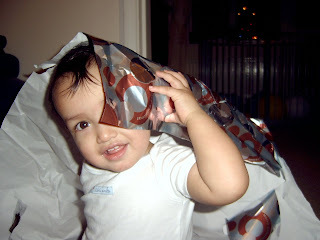 Something that would remind me of this, his first Christmas. So I plonked him down on the wrapping paper. And a tradition was born. Every Christmas I do the same, take photos of him surrounded in wrapping paper. It works the same for birthdays. That picture of him asleep on the wrapping paper is so precious! Such a neat tradition! Very sweet pictures! A great idea. Be sure to post this year's! I'm sure his smile will stretch ear to ear. I love the pictures of your son. He's clearly got the Christmas spirit! What a fun tradition. :) Merry Christmas. That's a good idea for a tradition! Thanks for sharing! I know exactly what you mean about trying to generate some excitement about Christmas. That is one of the reasons why the Tour was started in the first place a couple of years ago! This is a cute tradition and one that will be easy to maintain over the years! Thanks so much for participating in the Advent Tour this year. That's a lovely tradition! My mom would do something similar when we were younger. We had a huge picture window in a house we lived in in California and she would take our picture in front of the window every year on our birthdays. Hi there - I just wanted to say I read your post (I found it via a blog, via another blog, via another blog...) I can totally empathise with your post - my little one is going to be 9 months this week and short of eating her way through the gift wrap (eating paper is her current big thing!) I really want to do something so we can have a nice tradition to keep alive. Your blog is lovely - a real pleasure to read! Hope you have a lovely Christmas - with lots of wrapping paper! Cute, if my little ones were still little, I would so steal this idea. A last they aren't so little and in fact are old enough to tell me no. But I may try Christmas morning anyways. Cute post I love it. Merry Christmas. What a great post!! I'm wishing you and yours a very Merry Christmas! That's such a nice tradition! You'll have some great photos to share with him when he's a bit older. What a cute tradition :-) Have a wonderful Christmas. We have the tradition of new pajamas every year, I love it. I hope you have a wonderful Christmas this year, and all the best in the New Year! Thank you all - I hope you guys had great Christmases as well! This year's wrapping paper photos are finally up!